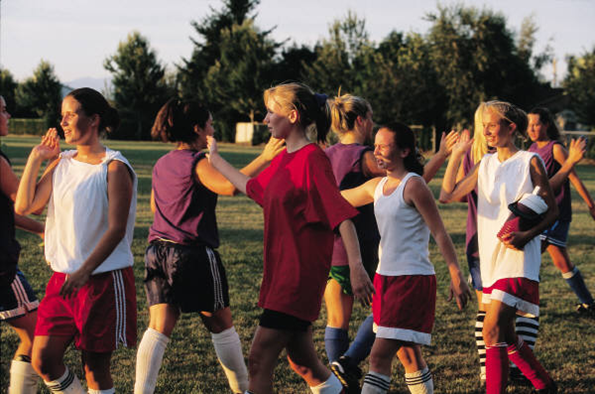 Sportsmanship is one of the reasons why soccer is the most popular team sport. The idea of sportsmanship is basically ‘playing the game of soccer fairly and cleanly.’ Players who play with the spirit of the game in mind are giving a lot more respect as a leader than that of a player who is constantly bringing the game down by swearing, cheating, or fighting. When there is a presence of sportsmanship on the field, the game of soccer dramatically improves. You are then playing soccer for the love of the game without any intent of hurting the opponent. The main objectives of the Rec Plus soccer program are to have fun and to help every child develop as a soccer player. If one team is greatly superior to the other in any match, these objectives are often lost. Therefore, the WCSSF board has adopted a “4-goal” guideline to encourage coaches to restore the objectives in games that are mismatched. The rule simply states, “If a team has a four goal advantage, the team is to stop the attack and control the ball.” It is an easy rule, but is often misunderstood. The rule does not state that a team cannot score more than four goals or that there cannot be more than four goal difference between the two teams. The rule does imply that the coach should stop the team from attacking or going straight to the goal. The coach should slow down the scoring, and work on other skills with the team (see “Ways to Change the Attack” below). It is important for coaches to guard the dignity and integrity of the other team. Beginning in the Spring of 2014, the “Sportsmanship Guideline” is only in affect for 10U, 12U, and 15U divisions. It does not apply to the High School division. The coaches within the High School division should continue to exhibit good sportsmanship when involved in a game with mismatched teams. 1. Move the offensive players to defense and vice versa. 2. Remove your main goalie and put in a player who is not a goalie. 3. Remove a player or two (play down). Never do this at the start of half time because it is too obvious. Wait until you sub and, for example, you will sub in 3 players but pull out 4 players. This one really makes the team have to play harder and smarter to keep the control of the ball when they are outnumbered on their offensive end. 4. Make all the players dribble only with their opposite foot. 5. Make all players shoot with the opposite foot. 6. Tell the team that all players must touch the ball before they can begin a drive to the goal. 7. Only allow one or two players to score (usually players who have not scored for the season). All other players must pass, cross, chip and etc. to these players if they want the team to score. 9. The players can only shoot outside of the 18 (Penalty Box). This one is not quite as effective in slowing down the scoring as #7 and #8, above, but if you have to slow down scoring for a large part of the game, this one can help mix it up a little bit for your team. 10. Make the team carry the ball to all four corners of the field before they can begin an attack. This method and #6, above can be used in conjunction with any of the other methods. 13. If all else fails, you can have your team shoot at a target behind and way off to the sides of the goal in order to still maintain the forward drive of the play while maintaining formation, support, and full normal team set up. Only use this one with select players during a game and not on the whole team. Please don’t yell out to your team that they can’t score. Please don’t let your players make comments about not scoring or that they are changing the way they are playing. As the coach, you are responsible for how your team handles this situation. Sportsmanship is imperative. Everyone deserves to leave the field with their dignity intact. Continue to encourage your players to play their best. Your players key off of your response to the score. We are here to build skills and have fun. Please don’t complain about the other team to your players. Please don’t complain that the other team has scored.